Rooms, services The guests of Vila Diandra Eforie Nord may stay in 21 nicely furnished, comfortable rooms in Eforie Nord. If you are arriving by car, the pension will provide you a parking space without charging you any extra fees. Air-conditioned rooms are available for reservation (please take a look at the information sheet of each room to see if it has air-conditioning). At the pension you may go online via wireless Internet connection (WiFi). 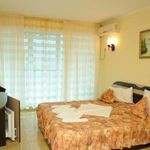 An exact and detailed list of equipment in the rooms and of the services provided by Vila Diandra Eforie Nord you will find on the information sheet below and on the information sheet of the individual rooms, including any applicable additional fees. Payment The following methods are available to pay the reservation: cash, bank transfer. To be able to accept your booking request Vila Diandra Eforie Nord is asking for 30% advance payment. Arrival, opening hours The earliest time for arrival and check-in is 14:00, the latest time for departure and check-out is 10:00. The personnel is at your service in English and Romanian languages. Reserve your accommodation and Vila Diandra Eforie Nord will directly send the confirmation in 1 workday. The rating of Vila Diandra Eforie Nord is 9.7 from the maximum 10, 3 based on actual and valid guest ratings and reviews.